As a professional blogger now since 2011, I’ve had my fair share of experiences with different companies for various online blogging tools. And if I am being honest, not all tools are equal. One of the most important tools that professional bloggers need to have is a good email service provider. I have used several but have now landed on my favorite one (more on that in a bit). But today I want to share with you 5 reasons should use ConvertKit as your email service provider. 1. You are looking to monetize your list. 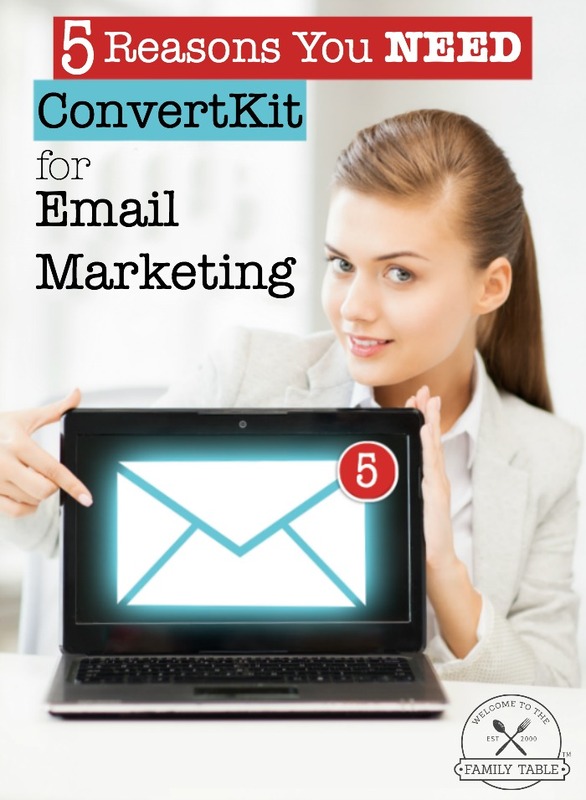 If you don’t want to monetize your email list, then ConvertKit is not for you. ConvertKit has the most awesome funnel system (called sequences) that I have seen for professional bloggers. There are so many options to connect with your audience and monetize your email list, getting the right content to the right people. It is super easy to set up simple sales funnels, automated email courses, and much more. 2. You don’t like paying for a subscriber more than once if they are on more than one of your lists. Nope. Not me. I’ve used several email providers that counted one subscriber across multiple lists multiple times. So in essence other ESP’s made me pay for one subscriber more than once making my costs go way up. While I have a few different websites, some of my email subscribers like all of my content and are subscribed to all of my lists. But ConvertKit only makes me pay for an email address/subscriber one time! Yes! Isn’t that awesome? Less $$ for me and at the rate and size of my lists with them, this matters! 3. You like to be organized. You can tag your email subscribers to any custom tag you want to efficiently and effectively identify them. For instance, I have all of my new email subscribers for Today’s Frugal Mom™ automatically tagged with “TFM Master List” so when I send out emails meant for the entire list – everyone on my entire TFM list will receive it. I have some sublists that are more niche and so I am able to tag those accordingly and name them something else. The ability to tag matters when you are delivering content for a niche part of your list. Not everyone on my list wants to receive things for homeschooling moms, so they are tagged differently. All tagging is done through creating “triggers” that are easy and painless to set up. Tagging is a powerful and effective tool for keeping your list happy, yourself sane by being organized, and a steady stream of list-building income. Choose exactly who should receive your broadcast emails through custom segmenting. Group subscribers from multiple forms, tags, and courses to all receive the same broadcast. This is just another step of organizational awesomeness that will help you keep your list in-check and give your subscribers what they are looking for. Smartest thing, ever. 4. You want higher open rates & click-throughs. Yes, please! This is something that you will definitely get with ConvertKit. We have an email list that our subscribers will actually get the emails we send in their inbox, open them, and click through to our content! I have seen a huge increase in my open rates and click-through rates. After talking extensively with the amazing people at ConvertKit I am certain that because the company is still relatively new, they have used their resources and knowledge to make certain that there are not any spammers on the network which helps drastically reduce the way that emails are delivered. 5. You like user-friendly interfaces. One thing you will find out very quickly is that ConvertKit has a very easy-to-use interface. YAY! I love this because I have had to ask very few questions and set up my account quickly and easily. We tested out the service with only one of our smaller email lists (just under 10K) and have since moved over another of our lists (just over 15K) and had it all set up within an hour! We are currently working on a few email sequences (think email course/drip campaign) that are 52-weeks long. While I dreaded the project, ConvertKit makes it all so easy and organized that I finished it in a matter of 3 hours! Yes! 3 hours! And this is all because their user interface is easy and smart. But if you want life to be hard, ConvertKit is not for you. Well I can honestly say that if you don’t like making money, want to pay more if a subscriber is on more than one list, don’t like organization, don’t like your emails to get opened nor clicked-through, and like frustrating hard-to-use interfaces: ConvertKit just isn’t for you. On the other hand, if you want to make more money, save money, become more organized and efficient with your business, get more open rates on emails that you send (along with higher click-throughs), and appreciate simplicity in user interfaces: THEN ConvertKit IS FOR YOU!